Elementary school principals from all over the country gathered in Nashville, Tenn., for the National Association of Elementary School Principals (NAESP) Annual Convention & Exposition held July 10-12. 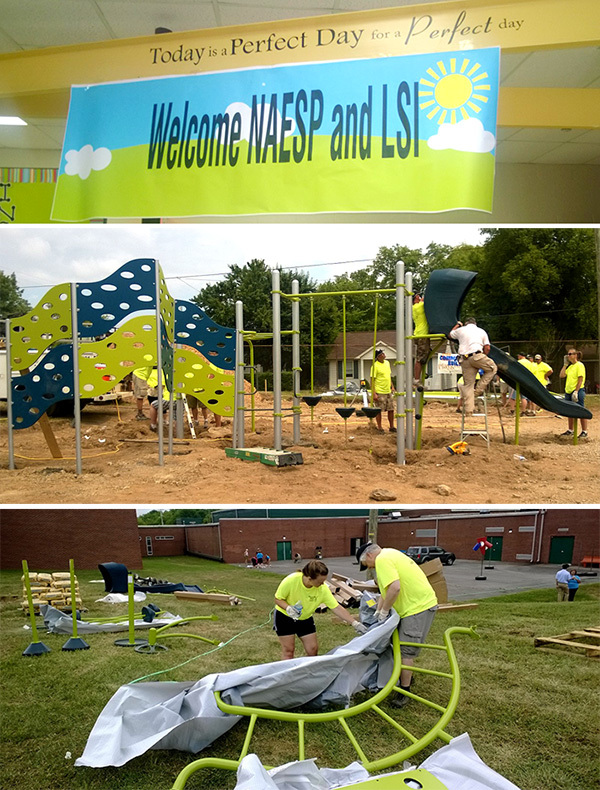 But before the Convention could kick off, we helped celebrate NAESP’s sixth annual Community Service Day. Together with nearly 100 elementary and middle school principals, we installed new playground equipment including a zip line-like component called the ZipKrooz™ and the OmniSpin® spinner at Inglewood Elementary School. We’re proud to have partnered with NAESP to bring play to schools across the nation. Learn more about our partnership here. This entry was posted in NAESP, National Association of Elementary School Principals, Play, Play Environment, Playground, playgrounds, Schools and tagged Community Service Day, Elementary school, Elementary school principals, Inglewood Elementary School, NAESP, Nashville, National Association of Elementary School Principals, OmniSpin, Tennessee, ZipKrooz by PlayLSI. Bookmark the permalink.